Nepal Update: Quake's Death Toll Rises; U.S. Chopper Still Missing : The Two-Way Emergency officials in Nepal say at least 76 people have died in Tuesday's earthquake, which hit as the small country is still coping with a prior quake that killed more than 8,000. A woman in Kathmandu walks past rubble following several massive earthquakes in Nepal. Officials say at least 76 people died in Tuesday's magnitude-7.3 quake. Emergency officials in Nepal say at least 76 people have died in Tuesday's earthquake, which hit as the small country is still coping with a prior quake that killed more than 8,000. A U.S. Marine helicopter that had been aiding relief efforts remains missing. 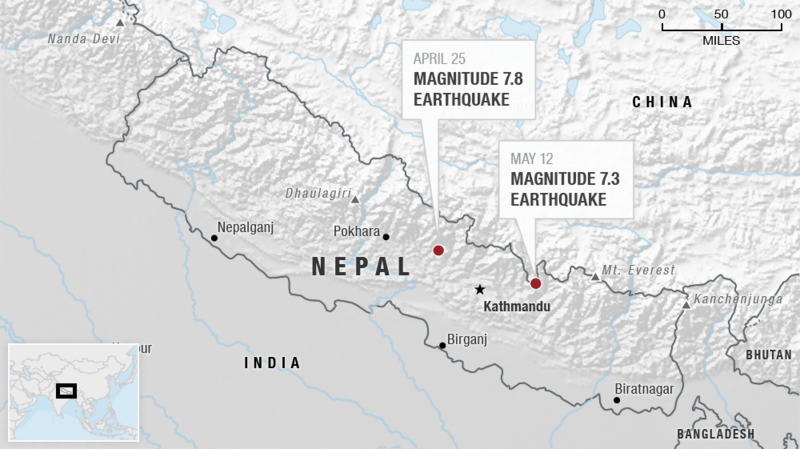 On April 25, a magnitude-7.8 temblor devastated swaths of Nepal. The most recent quake was measured at 7.3, followed by a 6.3 quake half an hour later. Aftershocks continued to strike Wednesday, including at least two that hit shortly after noon, each around magnitude-5. 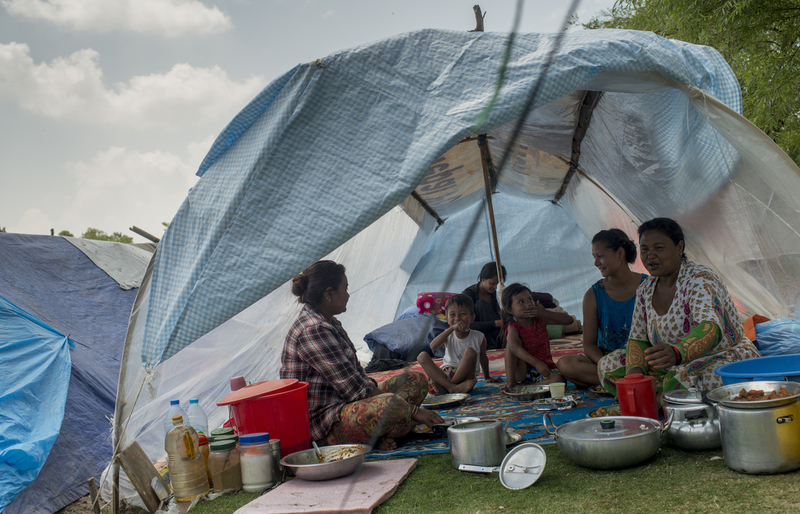 A family sits inside a tent at Kathmandu's golf course Wednesday, a day after a strong earthquake hit the area. The American UH-1Y Huey helicopter went missing Tuesday morning local time in a remote mountainous region near Charikot, Nepal, where it had been delivering humanitarian aid. Six Marines and two Nepali soldiers were aboard. Unconfirmed reports suggested the aircraft might have been having fuel problems. The search for the helicopter has included at least nine flights by two Hueys from Marine Light Attack Helicopter Squadron 469 and two Ospreys from Marine Medium Tiltrotor Squadron 262, according to a release from the U.S. joint task force in Nepal. "The Nepali military has launched a ground search and an official said the American helicopter may have gone down in a riverbed there. "Pentagon officials were quoted saying there was no indication of a crash. But the area is described as among the worst-hit by two powerful earthquakes that struck Nepal. "Damage from the second quake yesterday is still being assessed. Thousands woke this morning in the open having once again resorted to sleeping outside their quake-shaken homes."